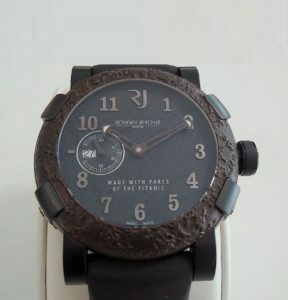 The bezel on this timepiece contains RARE rusted metal from the TITANIC Ship. The dial contains coal which was recovered also at the site. It is a 46mm black stainless steel case with automatic movement and date. The case back is etched with an image of the Titanic and Limited Edition serial number #1/1. It is available on sporty black rubber strap and folding buckle. This watch comes with a letter of authenticity issued by Harland & Wolff in Ireland, where the Titanic was built. Retail PRICE $17,800 dlrs.